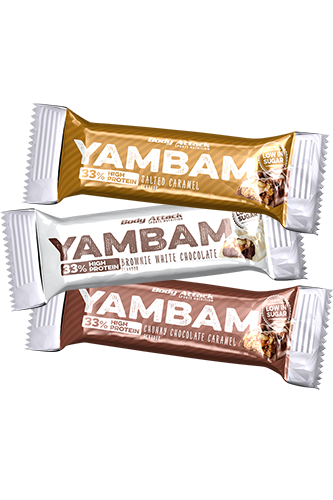 Choose between Salted Caramel, Brownie White Chocolate and Chunky Chocolate Caramel and get ready for the protein bar amongst protein bars: YAMBAM! You´ll never want anything else again! Each 40 g bar contains around 13 g protein from high-quality whey protein concentrate and soy protein isolate. This corresponds to a protein content of 33 %. And yet, this delicious chocolate-covered, peanut-filled sports snack contains only 4 g sugar per bar.